There are different elements which have to be taken care in the localization process.i.e. The language should be spoken in the target market. Adapting graphics to target markets, i.e. text and graphics containing references to objects, actions or ideas which in a given culture may be subject to misinterpretation or viewed as insensitive. Modifying content to suit the tastes and consumption habits of other markets. 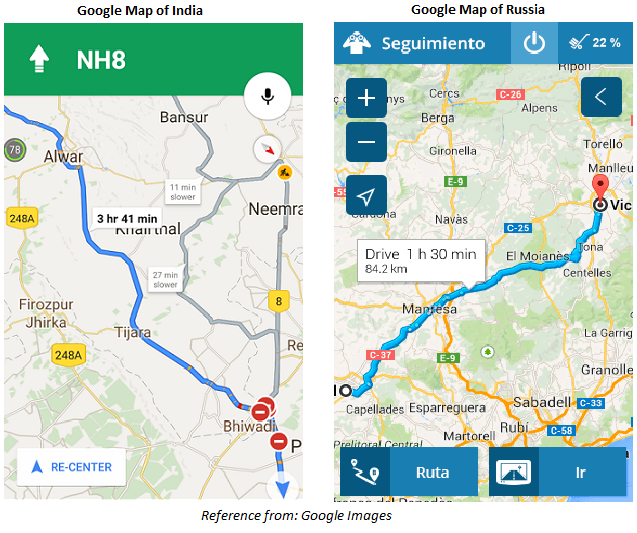 Adapting design and layout to properly display translated text. Converting to local requirements(i.e. Currencies and units of measure). Using proper local formats for date, address, and contact numbers. For example: Imagine if you are surfing websites to buy any product online, and on one website you see the product is available but you are not aware of the language, currency displayed on the website, and the graphics are not proper, then probably you will shift from that particular website to some other website which you can recognize and understand. The ultimate goal of localization is creating a user experience that successfully drives your marketing strategy and business goals by connecting with consumers on a deeper level. So if your audience wants to conversate in their native language, then your business better listen if you expect to stand out in the competition. Internationalization: Internationalization(also referred as “I18N”, where 18 is the number of letters between I and N in the English word.) is the process of design and development of a product, application or document content that enables easy localization for target audiences that vary in culture, region, or language. 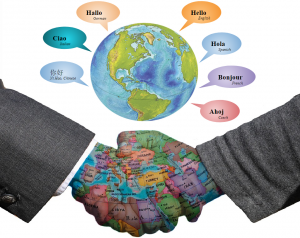 The internationalization process is sometimes called translation or localization enablement. Things like enabling the use of Unicode, or ensuring the proper handling of legacy character encodings where appropriate, taking care over the concatenation of strings, avoiding dependence in the code of user-interface string values, etc. 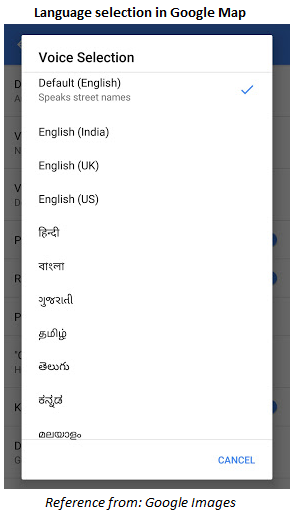 Providing support for features that may not be used until localization occurs. For example, adding markup in your DTD to support bidirectional text, or for identifying the language. Or adding to CSS support for vertical text or other non-Latin typographic features. Separating localizable elements from source code or content, such that localized alternatives can be loaded or selected based on the user’s international preferences as needed. Economically, Internationalization can refer to an organization that takes steps to improve outside its country and into international markets. The trend towards internationalization has also pushed the world economy to a state of globalization, because of which economies around the globe are highly connected. 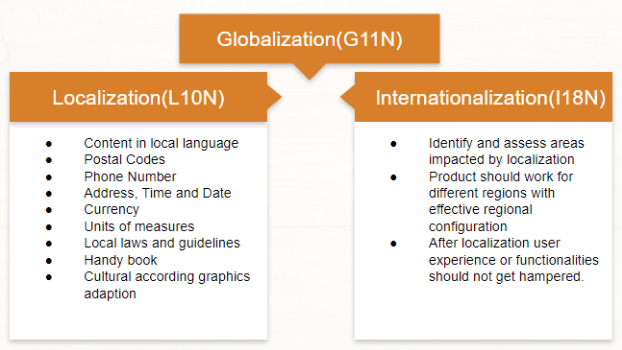 Globalization: Globalization(also referred as “G11N”, where 11 is the number of letters between G and N in the English word.) is a term used to refer to the gradual process of international integration stemming from the exchange of ideas, views, products, services, and other aspects of culture. This term describes the interaction of macro-social forces across the globe, which includes economics, religion, and politics. Globalization encourages the flow of products, services, economy, and labor. It opens the door for trade among different countries which helps in accelerating economy, human workforce, technology exchange, and transportation. Globalization is the key to successfully grow your business in the 21st Century, which helps in leading economic decision-making from local control to a globalized level. It results in expanding the company’s trade globally and independently. The World Trade Organization, along with the General Agreement on Tariffs and Trade (GATT), has been involved with removing trade barriers and reducing the cost of trading. Every coin has two sides, likely Globalization also have some benefits as well as some risks but it should be managed properly. Countries have to work together to implement effective and efficient global economic policies which can reduce the risks. As it is the key to increase human and economic empowerment.